Harmonic Learning’s Team-Building Fun and Games offerings bring your team together to have fun while learning about each other and how the team can best function. Have fun while learning about each other and how the team best functions. These games provide an intentional path to understanding how to be successful. Gather with your team for fun and games where you will not only have a ball (sometimes, literally, you'll be playing with a ball), but learn a lot about yourself and your teammates along the way. Our Fun and Game activities are designed to create a fun atmosphere where laughter and learning come in equal parts. We will work with your team to design a session that is a perfect fit for your team's needs. The session can be as short as a one hour gathering or as long as a multi-day retreat. We can design the session to take place in a standard conference/meeting room, or an offsite venue. Turn a conference/meeting room into a play room where your team will engage in a series of fun games from our Harmonic Team-Building: In the Bag product (see below). Each game helps the team-members better understand the team dynamics and how to rely on each other's strengths. A lesson on creative thinking, cooperation and productivity where two teams compete at putting together a small piece of furniture. Oh, and by the way, there are no instructions, so the team has to figure out how to accomplish the task through a creative brainstorming process. A lesson on creativity and diversity where the team will make play-clay with creative use of color mixtures, and then create sculptures depicting what’s important to them outside of work. A competition where two teams race in a series of challenges where the need to multitask causes the difficulty in completing the tasks. After the series of fun challenges, the teams experience a single-tasking race to illustrate the need for concentration on key, mind-intensive activities. Get out of the workplace to work with your team to use riddles and hidden clues to find items in your area. We work closely with the leader to design a scavenger hunt that will be suitable for your city/location and meet learning points that the team needs to discover. We will partner with a local pottery/glass painting facility to lead your team in a guided activity with a specific theme that will be used in a debrief where the teammates develop greater understanding of their co-workers. Escape the workplace and come to a local Escape Room where we will take your team through a challenging situation where you work together to escape. We will do pre/post team debriefs to discuss how each team-member uses various strengths to help the team succeed. We partner with Ropes Challenge Course venues to give your team an exciting experience in developing trust and teamwork. We will enhance the ropes experience with pre/post team debriefs to apply the discoveries to your unique team. Don't limit your thinking to just these ideas. The sky's the limit (sure, we could do team-building on a plane) and can work with you to design a uniquely creative team-building experience that's perfect for your team's needs. Harmonic Team-Building: In the Bag. This kit contains everything needed for 40 fun and meaningful activities. 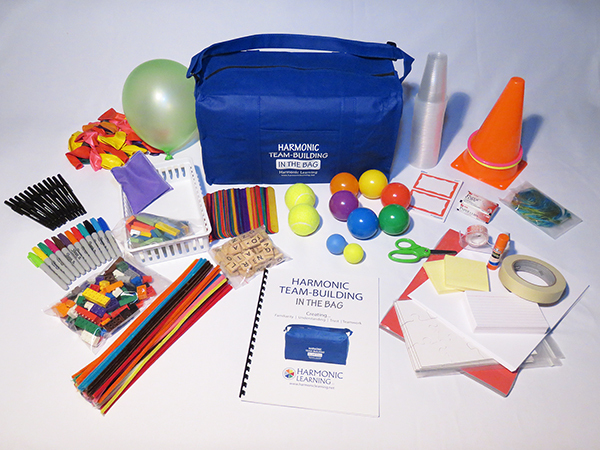 When you take part in a Fun and Games activity, your team will receive a "Harmonic Team-Building: In the Bag" kit from Harmonic Learning. The bag includes all of the supplies and materials needed for 40 fun and meaningful activities. And the comprehensive guide provides easy, step-by-step instruction in how to lead each activity. We will use the bag during your activity and then you will be able to continue the team-building for years to come. The Bag is also available as a stand-alone product.